We had been pondering what to do with our son's growing LEGO collection. 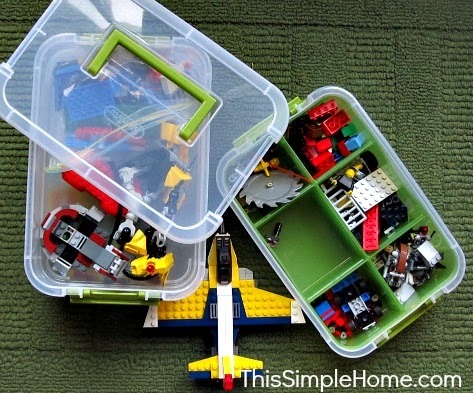 Pinterest offered lots of suggestions, but my husband wanted it to be portable LEGO storage. Finally, we used a snapping and stacking container we found at Target. The brand is Sterilite, and it is much like Snapware. Our daughter actually has her collection in a Snapware container. They truly work the same, however, this storage container has three tiers instead of just two. The top two currently hold various LEGO pieces. 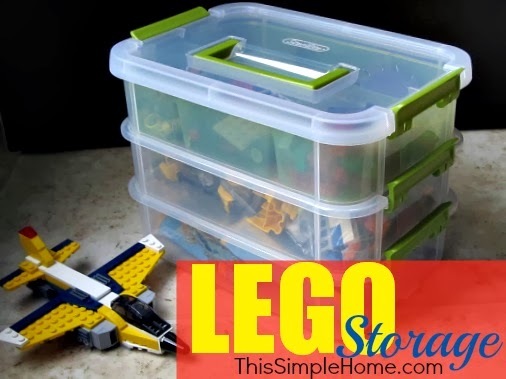 The bottom container holds all of the booklets for the various LEGO kits. This is working really well for us. We basically had to explain to our son that he could not have more LEGOs until we had a better way to organize them. We also have an under-bed storage bin full of LEGOs from my husband's childhood. We have not yet sorted them. How do you store LOTS of LEGOs? Sadly, I cannot find this exact Sterilite container at their webiste, Amazon, or Target. This is about the same size in Snapware, but does not have the dividing trays. I would suggest you visit your local Target or other home store to see if you can find something similar. Big question...what should we do with the LEGO boxes? Should they be saved or disposed of? Ours right now is in a gigantic tub that doesn't really work for us. We're trying to decide what we want to do. Of course my boys will grab a smaller box and carry that around stuffed to the gills with the pieces they want for playing.